This article is about the daughter of Thomas Jefferson, the third President of the United States. For the wife of Thomas Jefferson, see Martha Jefferson. Martha Jefferson "Patsy" Randolph (September 27, 1772 – October 10, 1836) was the eldest daughter of Thomas Jefferson, the third President of the United States, and his wife Martha Wayles Skelton Jefferson. She was born at Monticello, near Charlottesville, Virginia. 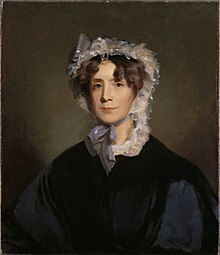 She married Thomas Mann Randolph Jr., who served as a politician at the federal and state levels and was elected a governor of Virginia (1819–1822). They had twelve children together. When her widowed father was President, she sometimes lived with him at the White House, serving as his hostess and informal First Lady. Martha was very close to her father in his old age. She was the only one of his acknowledged children to survive past age 25. Martha Jefferson was born on September 27, 1772, at Monticello, her father's estate in Virginia, which was then British America, to Thomas Jefferson and Martha Wayles Skelton. During her parents' ten years of marriage, they had six children: Martha "Patsy" (1772–1836); Jane (1774–1775); a son who lived for only a few weeks in 1777; Mary Wayles "Polly" (1778–1804); Lucy Elizabeth (1780–1781); and another Lucy Elizabeth (1782–1784). Only Martha and Mary survived more than a few years. Her paternal grandparents were Peter Jefferson, a planter and surveyor who died when her father was 14, and Jane Randolph. Jefferson vaguely knew that his grandfather "had a place on the Fluvanna River which he called Snowden after a mountain in Wales near which the Jeffersons were supposed to have once lived". Her mother was the only child and daughter of John Wayles (1715–1773) and his first wife, Martha Eppes (1712–1748). Wayles was an attorney, slave trader, business agent for Bristol-based merchants Farrell & Jones, and prosperous planter who was born in Lancaster, England and had emigrated alone at the age of 19 to Virginia in 1734, leaving family in England. Her maternal grandfather died in 1773, and her parents inherited 135 slaves, 11,000 acres (4,500 ha; 17 sq mi), and the estate's debts. The debts took her father years to satisfy, contributing to his financial problems. From age 12 to 17, after her mother's death, she lived in Paris with her father while he served as U.S. Minister to France. Jefferson enrolled her at the Pentemont Abbey, an exclusive convent school, after receiving assurances that Protestant students were exempt from religious instruction. After Patsy expressed a desire to convert to Catholicism and said she was considering religious orders, Jefferson quickly withdrew her and her younger sister Polly from the school. In 1790 at the age of 18, Martha married Thomas Mann Randolph, Jr., a planter, who was her third cousin. Soon after their marriage, her father, Thomas Jefferson, deeded eight slaves from Monticello as a wedding gift, including Molly Hemings, the eldest daughter of Mary Hemings. Thomas Jefferson Randolph (1792–1875), who married Jane Hollins Nicholas (1798-1871). James Madison Randolph (1806–1834), who was the first child born in the White House. Meriwether Lewis Randolph (1810–1837), who married Elizabeth Martin. After his death, Martin remarried to Andrew Jackson Donelson, a nephew of President Andrew Jackson. George Wythe Randolph (1818–1867), who briefly in 1862 was Secretary of War of the Confederate States of America, and who married Mary Elizabeth Adams Pope. Martha Randolph educated her children at home, likely with the help of private tutors, as most planters did. Although she was engrossed with the cares of her large family, she made several extended visits to the White House (then known as the President's House) when her father was president. She visited with her husband and children in 1802, with her sister Mary in 1803, and during the winter of 1805-06. During her visits she served as his hostess and informal First Lady, since Jefferson was a widower. Martha was estranged from her husband until shortly before his death in 1828. She died at their Edgehill estate in Albemarle County, Virginia. She was the last surviving child of Thomas and Martha Jefferson. She inherited Monticello from her father in 1826, as well as his many debts. Her eldest son Thomas Randolph acted as executor of the estate. Except for five slaves freed in her father's will, and "giving her time" (informal emancipation) to Sally Hemings, they sold the remainder of the 130 slaves at Monticello to try to settle the debts. Within a few years, they sold the plantation as well. After business reverses and the death of her husband, she considered establishing a school. The state legislatures of South Carolina and Louisiana each donated $10,000 to her for her support. Increasing financial difficulties obliged her to sell Monticello. The property was finally sold to James T. Barclay in 1831. He sold it in 1834 to Uriah P. Levy, a wealthy United States naval officer (later the first Commodore of the Navy) and Jefferson admirer. Although Levy was then based in New York, his Sephardic Jewish ancestors had been resident in the South for five generations. Levy invested his own funds in renovating and preserving Monticello. In the 1995 film Jefferson in Paris, Martha Jefferson was portrayed by actress Gwyneth Paltrow. ^ a b Malone, 1948, pp. 5–6. ^ Tucker, George (1837). The Life of Thomas Jefferson, Third President of the United States; 2 vol. Carey, Lea & Blanchard. ^ Wead, Doug (2004). All the Presidents' Children: Triumph and Tragedy in the Lives of America's First Families. Simon and Schuster. pp. 127–129. ^ a b "Martha Jefferson Randolph". Monticello.org. Retrieved 7 May 2017. Brodie, Fawn (1974). Thomas Jefferson: An Intimate History. W. W. Norton & Company. ISBN 978-0-393-31752-7. —— (1990). Empire of Liberty: The Statecraft of Thomas Jefferson. Cogliano Press. ISBN 978-0-19-802276-3.